Driving shoes are a difficult subject. If you’re in the market for a pair then you’ve likely got a cool sports car, an interest in spirited driving and want greater feel from the pedals. We're here to help you toe the line, by selecting the very best driving shoes available to buy. Haven't heard of driving shoes before? The idea is simple - they feature thin soles to help deliver an undiluted feel of the pedals to your feet. They also possess names like Maranello, which tread the oh-so-fine line between cool and nerdy, and a colour pallet stretching from inoffensive brown or navy, to louder-than-LaFerrari red and yellow. Many of these shoes follow the mocassin design, where the sole and sides are made from one, continuous piece of leather or suede, with a one-piece or multi-piece rubber sole attached directly to the fabric. A ‘pebbled’ sole offers more flexibility and greater pedal feel, while a more traditional sole is more comfortable for walking - be it from paddock to podium or house to newsagents. The Gommino by Tod’s were first developed more than 35 years ago, so you know you’re buying into an established cornerstone of the driving shoe market with these suede slip-ons. Finished in navy blue, they have a full black rubber sole, helping them stand up to a bit of inclement weather and day-to-day use, as well as being the shoe of choice for that Sunday morning drive. Good value considering the all-leather design, these driving loafers are by Dune of London. Unlike most driving shoes, they feature laces for providing a more snug fit. The soft brown leather extends all the way around the base of the shoe, while the sole is made up of 12 separate pieces of rubber and outlined by some neat contrast stitching. Yes, we know. Ugg is better-known for those soft fluffy boots of the mid-2000s, but hear us out because these tan leather driving shoes feature precisely no fleece material. Instead, they offer a smart/casual look which manages to refrain from asking everyone what car they drive, and if they’d like to see a picture of your RS. The leather continues right around the base, which is decorated with a contrasting pale sole. These would look as at home on the deck of your boat as the footwell of your Lotus. 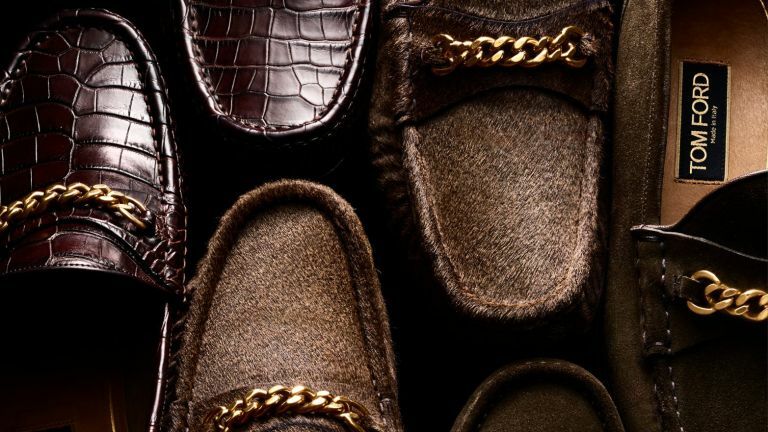 If you're looking for the most fashionable driving shoes, look no further than Tom Ford's. His signature 'York' shoes are all over the brand's Instagram feed, and they were worn with nearly everything at the SS18 presentation in Milan. This version has been expertly crafted in Italy from plush navy suede and topped with hand-polished gold chains. They're lined in leather for maximum comfort. Herring produces a wide range of driving shoes, but for those with petrol running their their veins the Maranello name makes these stand above the rest. With a traditional slip-on moccasin construction, these shoes are available in a range of colours from sensible blue, brown and black, to Rosso Corsa red (with yellow soles to match your brake calipers, naturally) and look-at-me Gulf Racing Aqua. Established in 1963, Car Shoe was taken over by Prada in 2001 and has since been spotted selling its wares at the Goodwood Revival. These suede moccasin shoes feature striking red and blue laces, soft leather inners and a pebble-style sole spread across the full length and width of the shoe, boosting both flexibility and feel. We’ll get straight to the point here; these shoes are included because they were worn by Ayrton Senna. A famous video clip of the Brazilian F1 champion driving a Honda NSX around the Suzuka GP circuit put the Herbert’s front-and-centre as Senna performed ballet on the pedals. Anyway...these Herberts don’t have the shiny leather of Senna’s, but look just as good in brown or tan suede with a pebbled sole and contrast white stitching. These driving shoes, made by the famous Italian designer, evoke the sophistication of the Riviera lifestyle of the 1950s. They feature a classic loafer design, and are finished with an iconic green and red Gucci stripe. The sole is pebbled, and they can be worn sockless with cuffed trousers or rolled-up denim. A classic moccasin, these shoes by Reiss are elegantly constructed in Europe from premium suede. They are crafted with a grip sole, and boast threaded lace uppers with metallic eyelet detail for a nautical-inspired touch. If you clicked on this article looking for actual motorsport footwear, then we’re sorry for taking so long to get there. Anyway, here is a pair of boots you definitely can’t pass off as stylish Italian loafers. The Tech 1-Z boot by Alpinestars is made from lightweight kangaroo leather and has FIA 8856-2000 approval, which means they are fire resistant for when you run out of talent. Buy them in white and people will think you’re The Stig. Honest. Which travel hair dryer will give you the best blow dry away from home whilst not taking up too much room in your case?